I will start out here by telling you something that you need to hear. Your business (or product, or project, or work product) is not your baby. Nope, it's not. In fact, it's not a sentient being at all, because it's a business (or project or something like that). Shocking, eh? When I phrase it that way, you probably think I am stating some obvious fact and being ridiculous. I am. But if as you read this, you start defending the position with statements like, "Well of course I would never mean that the business was a real baby," then you are exactly who needs to understand why this thing you work on isn't even a figurative baby. Sure, you make babies, too, but when it comes down to it, contribution of your genetic material is pretty much the "making" part on that end, and for the rest, the baby grows itself. Your business, on the other hand, owes its entire existence to you. 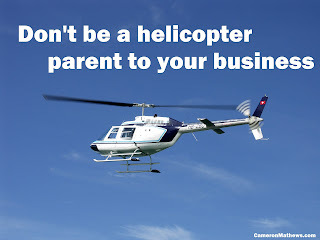 When you refer to your business as "your baby," you tell everyone that you are deeply connected to the inner workings of its growth. On the other hand, people who drop an idea for a business out there and let it organically grow without their heavy involvement don't refer to the business as their baby. 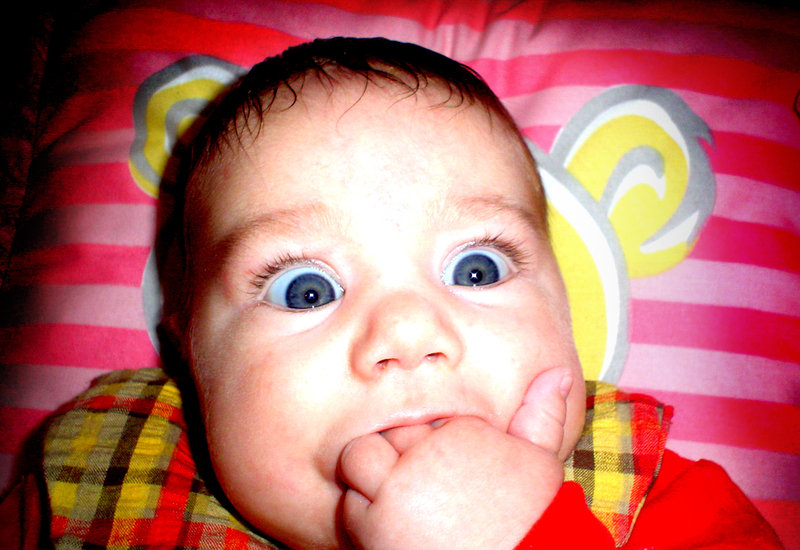 What if you treated your business really like a baby, though? You would let it grow on its own. You would guide it and reward it when it does the right things, scold it when it doesn't, and foster the types of behaviors that lead towards independence. You would allow it room to make mistakes. 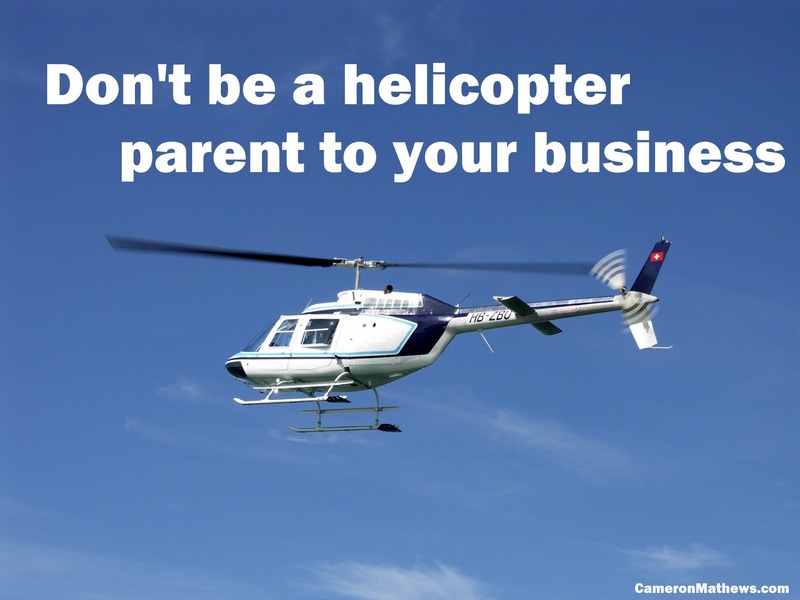 In the past few years, the term "helicopter parent" has come about to describe parents that continue to involve themselves in their children's lives in areas where the child (or young adult in some cases) should be making independent decisions. Similarly, small business owners and particularly passionate project leaders can have a difficult time separating their need for control from development of the teams into independent entities capable of making their own intelligent decisions. Try leaving a baby on the sidewalk and walking away from it once you have decided it is not working out for you (OK, really don't try this, and if you were considering it, then I have more to worry about for you than just how you are running a business). But seriously, you wouldn't leave a baby alone just based on how it affects you, because not only would that endanger the infant, but police and other would soon be after you, and you have an obligation and moral responsibility to the baby. You don't have the same sort of obligation to your business. It is not a person who will starve if left unattended. 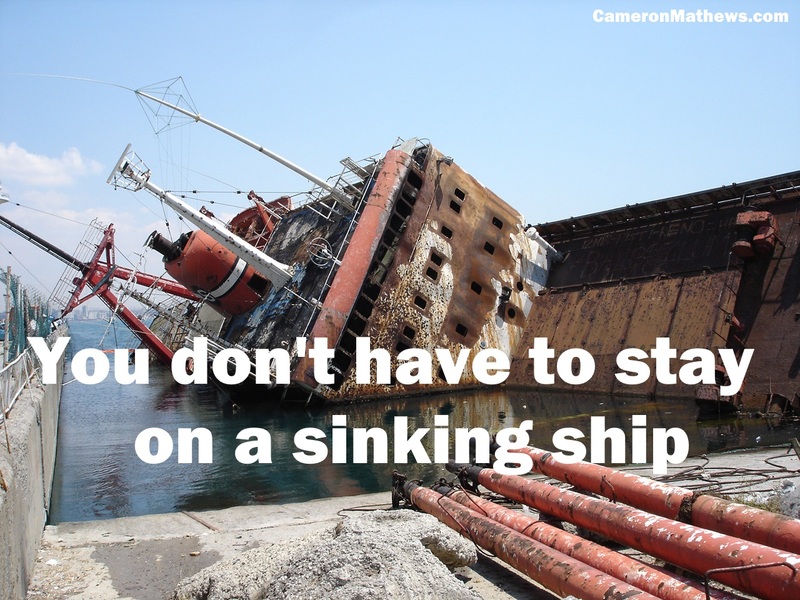 It might cease to function, but you could start it back up again if you truly wanted. Too often, business owners stay in a business longer than they need to because they feel some sort of obligation to the business. A need to see it through to the finish or to continue to chase success no matter how much the real performance trends away from it. 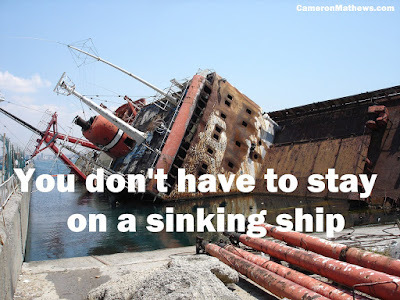 You don't have a responsibility to stay on the sinking ship. You may have obligations that require you to close up shop or shut down a project in the appropriate way, but you actually are a person (who needs to eat and all of that), and you need to make sure that this inanimate business does not drag you down with the undertow. In the overquoted and always accurate words of Kenny Rogers (he's an old country singer from probably before my time if I am being honest, but throwing this description in here for anyone younger than me who is scratching their head), "Know when to walk away, know when to run." OK, go listen to it on YouTube or something. I'll wait. When you are a parent, you are obligated to the child. You should sacrifice for yourself in order to get the child what he or she needs. Again, a business is not a baby. When you spend too much time sacrificing yourself for a business (particularly one that underperforms), the business does not necessarily benefit. In fact, it's more likely you are just grappling with one thing: pride. Sometimes pride as a business owner makes us deluded into thinking that we can't fail, or that if the business doesn't make us millions, that perhaps we, personally, are failures. Nonsense. Some business revolve around a really crappy idea. Some businesses have no market for their product. Some businesses have bad luck with timing to market. Some businesses try to start in the wrong point of an economic cycle. Some businesses enter an overly saturated market. Businesses fail for hundreds of reasons. The blame does not always fall squarely on the owner, founder, or manager. So stop thinking it is a personal reflection and move along. Do things that benefit the business, but don't kill yourself trying to make something from nothing. You want to take care of your baby? Raise her up, teach her well, and send her off to college. You want to take care of your business? Build it up, instill great business practices, and sell that puppy to someone who will scale it well. Look at your business as something that you grow and sell and repeat. Learn from your mistakes. Granted, this doesn't work for all business models, but if it can work for yours, try it. Sell your business and build something else. Have you ever been to a farmer's market? The guy selling tomatoes out of the truck does not put great personal investment in each red juicy tomato. He may focus on quality, and he may have pride in his work, but he is not personally invested in a single tomato. You know why? Because the intent is to sell that tomato so he can go grow more tomatoes the next week or next season. This step particularly applies to those individuals that are heavily invested in their products. Stop and realize, the more time you spend tweaking and perfecting that product, the less time you have to come up with something completely new that may yield ten or a hundred times the performance of the current product. Finish it, sell it, repeat. People often get caught up taking care of their "baby" projects or businesses. In reality, babies and businesses don't have a ton of similarities. And business owners should take advantage of those differences when they can. Learn to leave a failing business alone. Realize your pride and not the needs of a baby tie you down. And maximize the similarities as well. Grow and teach your business to operate independently. Let it scale beyond you. Learn to be pleased when the business no longer needs you. Smile as you sell it off and start the journey again. Maybe instead of calling it "my baby." try calling it "my teenager." It might put everything in a bit of perspective.